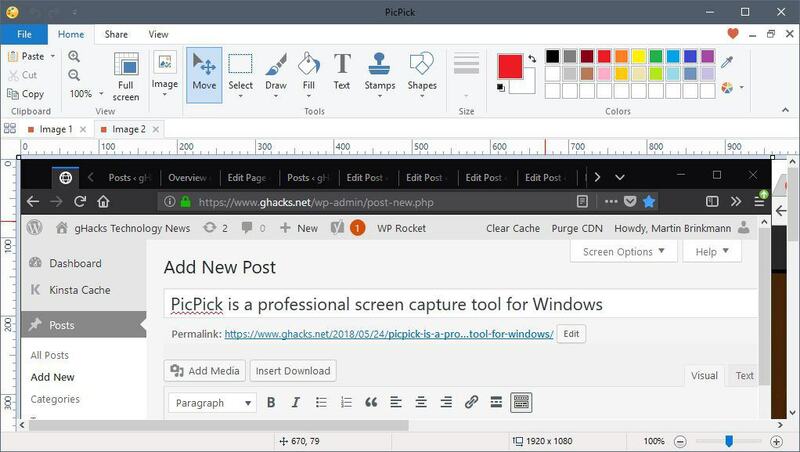 PicPick is a free for personal use (and commercial) screen capturing tool for Microsoft Windows devices that supports a wide variety of features and replaced SnagIt on my systems. Finding the right screenshot tool can be a time-consuming task; the sheer number of programs available for Windows (and other operating systems) means that you may spend days testing different tools to find the most suitable candidate for the job. From using built-in Windows tools like the Snippet Tool over free excellent solutions like Screenshot Captor to commercial programs like SnagIt. Check out our overview of screenshot tools for Windows for additional options. PicPick is a free to use if you use it in a home environment. The free version offers the same functionality as the commercial version and the only noticeable difference between the two versions is the occasional request to buy the program. As far as core features are concerned, there are plenty: you can use the program to take various kinds of screen captures and use the built-in image editor to edit screenshots before you save them to the local system or use sharing options. The screen capturing options offer anything you might need and then some. You can do fullscreen or active window screen captures as well as region, freehand, scrolling window and several other types of captures the program supports. The program maps keyboard keys to the main operations but you may use the system tray menu as well for that if you prefer to use the mouse. I take program window screenshots mostly, and Alt-Print does that when the program runs in the background. PicPick opens the image editor by default after you capture something on the screen. You can modify the behavior, so that screen captures are copied to the Clipboard, saved locally, or even transferred to remote locations instead by default. The built-in image editor offers an impressive range of features. It is tab-driven so that multiple captures can be open at at the same time in the interface. The functions that I use the most are text, shapes (arrow) and blur, but there are plenty of others. Add text (define font, size, color, and other formatting options). Add shapes such as arrows, boxes, or highlighted areas. Select any part of the image and use blur, pixelate, sharpen, or copy operations. Add effects to the image, or resize / rotate it. Use the built-in color picker. Most tools of the editor offer customization options. If you select a shape, you may change colors and thickness for instance. The editor displays a pixel ruler and highlights the cursor position on the ruler; that is excellent if you need to be very precise when it comes to edits. You may save images to the local system or use the built-in share functionality to send images to other programs or services. Supported are several cloud services, Twitter and Facebook, email and FTP, as well as any program available on the local system. PicPick supports a couple of extras that I don't use personally. Load the whiteboard tool to turn the whole desktop into a whiteboard. You can draw on the desktop and erase the drawing at any time; the whiteboard feature comes without save option, however, and you cannot capture a screenshot either. The program's preferences offer extensive customization options. Right-click on the system tray icon and select the "program options" entry to open them. 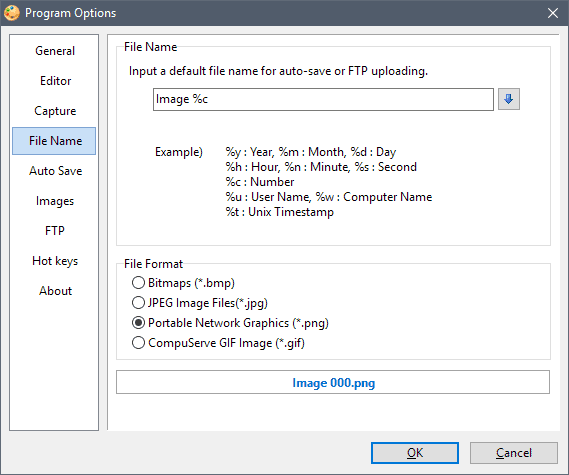 Change default file name of screenshots and the default file format (png). PicPick supports Bitmaps, JPEG, and GIF images as well. Setup up an external program for use with the share functionality. Select the default action after you capture a screenshot. I switched to PicPick after I used SnagIt for years. The main reason why I needed to do so was that SnagIt was an older version that crashed occasionally; since I did not want to buy the latest version of the application, I decided to evaluate other screenshot programs instead. PicPick supports all operations that I need to write reviews and blog posts. I use keyboard shortcuts to capture program windows or the entire screen, and the available tools of the image editor to highlight or blur content, to add text, and to save the edited screenshot to the local system. The program does not get in my way unless I use it, and while it is not super lightweight with its 80 or so Megabytes that it requires, it does not slow down the system in any way. PicPick is easy to use and very powerful at the same time; it can capture all major types of image screen captures and includes a mighty editor to edit images that you captured before you save them locally, remotely, or send them to other programs on the device. Now You: How do you capture screenshots? I’m a bit ‘old school’. I hit the PrintScreen button, and paste into Irfanview. Or leave on the clipboard manager (Ditto) in case I decide to use it later. RossN, IrfanView itself has a very nice screen capture feature. Just hit the C key. This is what I use but I will try PicPick. Quite enjoy this one too! Open Source and with all the features I could hope for. Yup, PickPic is good but ShareX is really really good. There’s FastStone Capture, that can make movies too and you can even edit them with the same tool! PicPick is not free for commercial use. Try ShareX, it’s completely free and has everything from screenshots to screen recordings. I am reading on the website from NGWIN that the PicPick free version is not automatic updating himself. So I am wondering tomorrow where can I find out which version is the last necessary to download version and also which version did I already download? I ask this because when I look at the already downloaded PicPick installer program features details tab, I am only getting a date of download and how large the installer is and nothing more? I’m using it and there is an option (General tab) to search for updates. The only question right now I have left is or the 64-bit version is only for the paying customer? There is one download for Microsoft Windows 10, 8.1, 8, 7, Vista and XP including both 32-bit and 64-bit versions. Belga, Again thanks for your comment. But then I do not understand why if PicPick is having only one specific program installer who is as you were writhing covering all different systems o.s. version (being 32 bit and 64 bit) why on main 64 bit installed system there installing a 32-bit version of PicPick? Me too! It works great. I can’t see a reason to switch to PicPick based on the article. I like the protractor function in PicPick to quickly get an exact angle I want to rotate with IrfanView Custom/Fine rotation function. This saves a lot of time since multiple guesses for the exact rotation are eliminated. +1 For Fast one. I’ve used them all and this is my goto. Haven’t found any that handle scrolling windows as well. Has all the important editing tools integrated and is super snappy. There is a portable version and is under continuous development. The only missing feature for me is the OCR where I use ShareX. Another one that has a very strong feature set is Ashampoo Snap. Unfortunately the company doesn’t have the best reputation because of PUP in their past. It’s also more sluggish. Much better. Screenshots in any shape / form, screen recording in any rectangle shape. BUT unfortunately DuckLink website: no downloads from any of the developers links. DuckCapture works very well for my needs, simple and quick. No bells and whistles. Glad you found alt link for this nifty app. Direct link I posted still ok for me on Win 10 X64 Pro. Have yet to give this new app PicPick a workout. Could be promising. ShareX…I often forget just how much it’s capable of, and am surprised when I revisit the settings to find how many of its functions I’m not making use of. I’d like to make a one-off donation to the ShareX development using something like PayPal, but frustratingly that seems impossible? I’ve considered switching from Snagit to PicPick. But when I do a Scrolling Window capture of a typical web page, I find PicPick reduces the capture so it always fits on only 1 page. If I do a scrolling window of a long web page, it still reduces the capture to just 1 page where it’s even smaller and harder to read than the typical web page capture when I print it (or print it to pdf). In contrast, Snagit allows me to increase or decrease the web page width/size to what I want and will automatically flow the capture over as many pages needed for my printout/pdf to show the entire web page at the width/size I selected. I have searched for a solution and written PicPick about this problem but received no reply. Do any of you guys know if this is just a limit in the current version of PicPick or if I am somehow missing some steps, and if so, what are those? Been using PicPick but am going to try “ShareX”. I’ve used the commercial program HyperSnap(HS) for ages but in case it goes belly-up, it’s good to have alternatives. 1. The ability to strip a horizontal or vertical cutout. This is very useful for trimming a clip. 2. The ability to automatically paste new clips onto the horizontal or vertical sides of a clip. Can PicPick (or other pgms) do these functions?